Yes, WMS have used the classic TV show Friends that ran from 1994 to 2004 and was centred around a shared house of six twenty to thirty-somethings. It's where Matt Le Blanc came to fame along with Jennifer Aniston and we hear the music from the show as we play and see an image of the cast over the reels but like Bally, WMS slots have suffered somewhat since their joining up with the Scientific Gaming platform. By this I mean the low-pay mechanics over a large amount of lines and the lack of definition on their html5 mobile format. This we saw with Bally's Wonder Woman Bullets and Bracelets too and somehow these trademarked themes just don't seem to transfer well from land-based to online which seems a shame for the players. So will this game prove to be a friend to our bankroll or perhaps a friend in need? 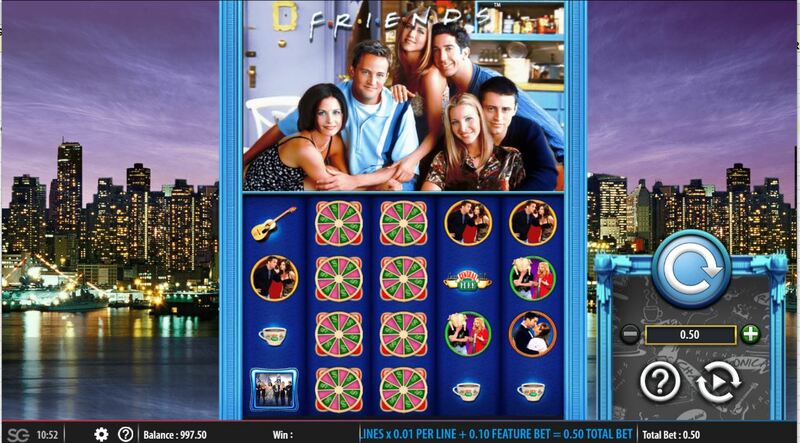 Friends slot offers 40 paying lines with an extra 10 coins for the feature bet so we pay 50 a spin. Reels are of 4 rows each and contain stacked symbols and alas their terribly low 5-of-a-kind pays we are getting used to in recent times, with the Wilds paying a mere 500 coins although there are stacked Jackpot Wilds on the centre reels which will pay a fixed 2000x bet if you land them in all 12 positions. 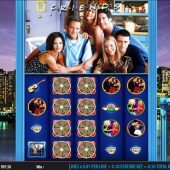 The picture symbols are images from the Friends' episodes with the Party Scene awarding 40 coins, Bed Scene 30, Male Cast 25, Kissing Couple 20, Phone Call, Turkey Scene and Ducks 15 coins and the Coffee Logo, Cup or Guitar a measly 10 coins for a full line. Mystery Stacks appear which will be replaced with either 2 or 3 different symbols when landing in view so you may be lucky and multiply those minuscule line pays a few times. Thanksgiving Spins - 10 free spins at 3x multiplier, no retriggers. Wedding Spins - 10 free spins with sticky Wilds, no retriggers. Party Spins - 11 free games with Walking Wilds. You get a sequence of spins where there are two adjacent reels Wild which move across to the right and back to the left over the 11 spins. This means that on the first, 6th. and 11th. spin you only have one reel Wild while the pair move off of the reel set.